Charm for an Unbeatable Lifestyle. Ever wonder what it takes for a city to score the #2 spot as best place to live in Canada? Look no further than beautiful, blossoming Burlington-- recently ranked as #2 best place to live in Canada by MoneySense magazine. This unbiased look at the best places to live in Canada used Environics Analytics of 34 different factors to help identify which are Canada's truly great places to live. This is the real deal: this vibrant city by the lake snagged the number two spot for offering a higher quality of life, based on a whole litany of reasons. Without question, proximity to Toronto holds huge appeal - both for commuters who work in Toronto, and for those seeking its cosmopolitan cultural offerings. But with its picturesque and historic downtown, beautiful Lake Ontario waterfront location, thriving arts community, nearly 400 restaurants and huge array of shopping options all within a very manageable area, one doesn't have to drive all the way to Toronto to experience the amenities of the big city; Burlington offers the best. Nature surrounds you - quite literally - when you live in Burlington. There's Bronte Creek Provincial Park, with its outdoor pool, scenic hiking trails, fishing, biking, camping and year-round activities. 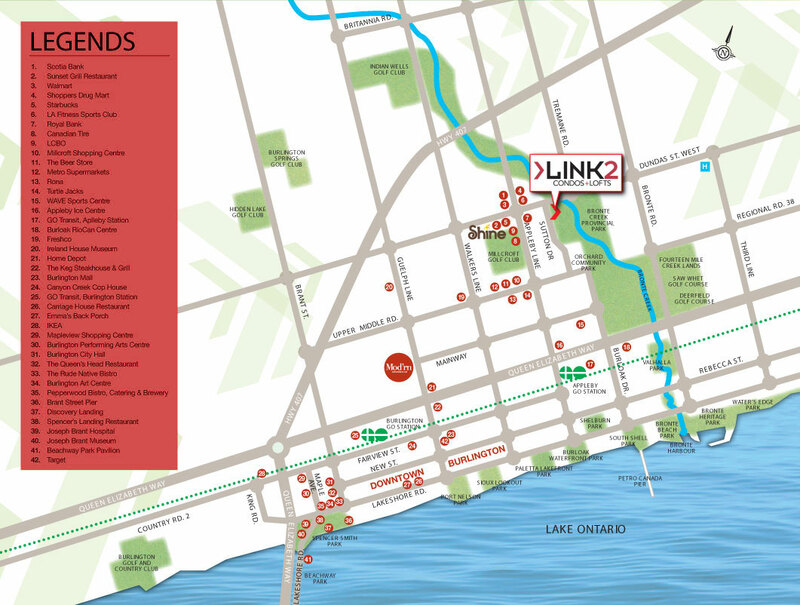 And there's the spectacular Burlington Waterfront's walking and biking trails, Bronte Harbour Yacht Club, beaches, parks, Burlington Pier and waterfront promenade. Clearly many have already discovered the allure of this vibrant community, Burlington is already home to people with some of the country's highest incomes. And there's still ample opportunity to live among the uber wealthy: the city has been named one of the top 10 spots for best place jobs in Ontario, and expects to add 20,000 new jobs over the next 20 years. From here, get anywhere. Burlington Transit operates 7 days a week, with convenient connections to Hamilton Street Railway and Oakville Transit. The Bus Rapid Transit System along Dundas Road also operates 7 days a week, and has a stop adjacent to the LINK community. GO Transit's Burlington stop makes getting into Toronto a breeze for commuters. And for those who prefer to drive themselves, the QEW, and highways 403 and 407 are just minutes away.